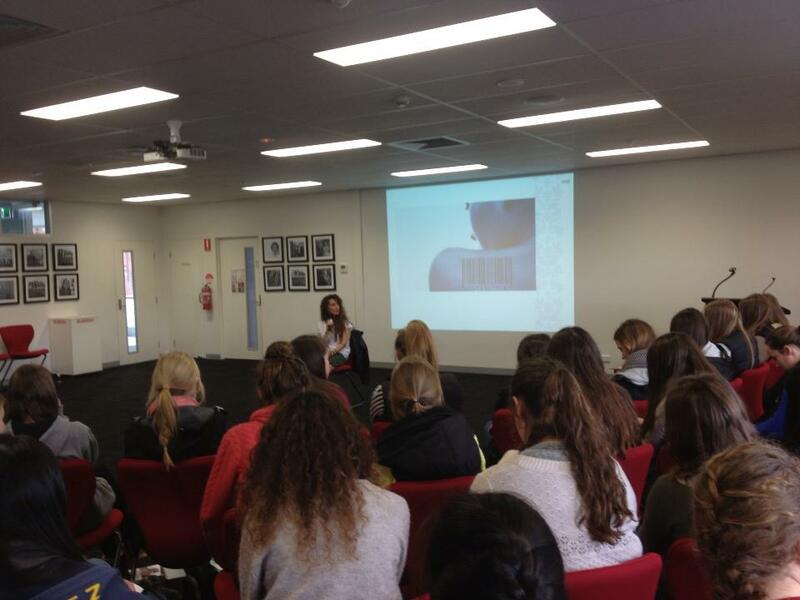 Last week Melinda Tankard Reist invited me to present with her to a group of Year 10 students at a Melbourne girls’ school. I had written a blog post a few days prior to my visit and couldn’t bring myself to publish it. I felt too vulnerable, too exposed. I promised myself that if the girls’ response was positive, I would publish it. As I was reading my piece, containing confessions I had never told a soul, the room fell silent. All I could hear was my heart pounding. I was too scared to look up so I continued to read. The end of my writing seemed a million miles away and all I wanted to do was finish and hope I wouldn’t be judged too harshly. As I was speaking about the importance of vulnerability for healing, I was feeling so uncomfortably vulnerable myself. Part way through my reading, I remembered my friend’s advice to me earlier that morning: “Speak from your heart, be true and you will always hit the mark.” Taking a deep breath I looked up at them for the first time. They were still. Some were crying. My heart sunk. But I continued to read. Owning my story I focused on the greater message I wanted to resonate with these girls; let go of the shame that is keeping you disconnected from who you truly are – and know that you are worthy of love and belonging. The tissue boxes were being passed around, as I continued to deliver my message. When I got to the part about my hospitalisation for a suicide attempt in grade 9, I could feel my stomach tighten. I hoped so badly I wasn’t going to be judged. Admitting to the eating disorder was, strangely given all I’ve been through, the hardest to confess. I carried a lot of shame for this. But I also know that it is so common amongst girls and if I can reach one girl who is struggling with it and let her know she isn’t alone, I just had to do it. Straight after the blog post was shared I launched into my poem. I had only performed it once before and never without reading it. Feeling confident I now knew it, I began to recite off by heart. It naturally flowed as though a memory deep inside held the words and all I had to do was trust and surrender and my soul would do the rest. When I had finished the room remained as still as when I had begun sharing 20 or so minutes before. Taking a deep breath I looked into their faces. I wasn’t prepared for their reaction. The room erupted. Through their tears they clapped and cheered me. I was honestly shocked. I turned to Melinda who was crying as well and insistently pointing across the room and for me to look. I turned and in that group of maybe 100 girls, one brave soul had risen on her own to give me a standing ovation. Crying unashamedly, she stood tall and clapped. It touched me so deeply I broke down and for the first time, I began to cry. In that moment of affirmation, I realised the importance of my own voice and how risking vulnerability and being courageous gives others permission to rise above and do the same. I knew then that what I was doing with my life mattered. Probably most importantly, everything I had been through wasn’t in vain. My father may have taken much away from me, but the gift rising above years of suffering has given me, I am now ready to bestow on to others. And anything that was once lost in my childhood, I am getting it back ten fold. Dr Brene Brown, an American researcher and storyteller defines courage as the ability to stand up and tell your story with your whole heart. She has a Ted Talk on the power of vulnerability. Her talk gave me the courage to do what I am now doing with my life. She speaks of the “wholehearted” having an ability to live authentically. To stand up in all of their imperfections and be seen, truly seen. Admittedly, this has always been me, but I certainly never saw this as a strength. Many friends of mine have always given me a hard time for this. Warning me I was too trusting. Too open with my honesty and lecturing me on how it would get me hurt. I never understood this as I always valued honesty very highly. And despite everything I have been through in life, I see the good in humanity and am always shocked when people lie and hurt others. We live in a society that compares our pain and suffering to others. We rate it. If we have been through something awful, we judge someone who is not coping with something relatively minor in comparison. If we have been through “minor” and are feeling hopeless we are ashamed of ourselves because we feel we have no right. Out of everything that has ever happened in my life, the most devastating blow for me was the serious knee injury I suffered, ending all hopes I had of playing university ball. Basketball had become my savior as a child and teen. I may have felt powerless off the court, but on the court I dominated. People respected me. Pain is pain and all loss is grief. It is all relative and felt and handled differently by everyone. We have no right to judge another by what we perceive they should be able to handle and in turn, we have to be gentle on ourselves and if something hurts, it hurts. And we reach out and tell someone. After Melinda and I finished the workshop, I was surrounded and completely embraced by the girls. Some came up individually to have a chat to me, others came in groups and hugged me tightly. As everybody eventually began to file out, I looked up and that girl who gave me the standing ovation was alone in front of me. She was crying and shaking and I reached out to hold her. In that moment I truly got it. We all have pain that we hide from the world and the relief we feel when we know we are not alone is so freeing. They weren’t crying out of devastation. They were crying because they realised they weren’t alone in this struggle of life and that if shame keeps us disconnected and silent, standing up and being seen and embraced despite our imperfections is critical to healing. So if by owning my story and talking about shame and how letting it go paves the way to help set others free, I’m happy driving that truck and laying down the road for others to walk upon. I will leave you with several of the responses I received on my Melbourne Freedom Page from the beautiful girls. They say I have made a difference in their lives but what I would like them to know is that they have profoundly affected mine. I walked into that room ready to discuss letting go of shame while I myself still had a little of my own and feared they would judge me. To experience not only no judgement but young girls looking up to me and seeing me as brave and courageous, made me become even more fearless in my determination to reach as many young people as I can. They showed me that what I had to say mattered. That because I risked vulnerability and stood before them in all of my imperfections and was embraced for and despite everything, it gave them permission to do the same. I guess courage really is contagious! I know that after your talk to my school group on Thursday that you have probably received quite a few of these messages but I far too often bite my tongue and don’t say the things I want to so, in the spirit of Thursday talk, I felt I just had to tell what an impact you had made on me. I have anxiety, quite badly. I’ve had it for around 2 and a half maybe three years and it can also send me into depressive states, the two are sort of linked in a chicken/egg manner where it’s hard to tell which causes the other. My anxiety is confusing, I know a lot of things that make me anxious but not a whole lot that doesn’t and I know that I can get very sad for no reason at all and then suddenly it becomes about everything. I am getting help but for me both my depression and especially my anxiety have been very shameful things. When you started talking about shame, a lot of things clicked in me and a lot of things triggered. Shame of my anxiety kept me from telling my parents about my anxiety till only a few months ago, shame of my anxiety had me passing panic attacks off as dizzy spells and sudden sickness, shame of my anxiety made it so much worse. Shame stopped me from telling anyone anything, let alone everything. I guess I thought that maybe I deserved my depression and my anxiety, that this was all punishment for things that I had done, even when I hadn’t even done anything wrong. So, when you started talking about shame , something inside me clicked big time. I was crying and listening and every word you meant made sense. I cannot imagine the horror you have gone through nor the strength it has taken to have turned your life in the amazing gift it is today, but every word you said about shame sunk into me , it stuck, something that’s never really happened before. You made me honestly believe that I don’t have to carry this weight with me, that shame is a wall that can be broken down, that I am worthy and I matter. The last 24 hours have been a bit of a blur but all I know is that you have honestly changed my life Carrie and will never be able to thank you enough. I know that my anxiety and my depression are not quick fixes or solvable at the flick of a switch but I feel like you have turned on this little light in my head and its slowly getting brighter. I just wanted to say the biggest thankyou to you, for coming to talk to us today. It was the most inspiring speech I have ever heard. It truly gave us all an insight into the harsh reality of our world, but it also gave us motivation and courage, that things that are tough and challenging can be overcome. Personally, I have been/am going through a few of the things you talked about, and to hear you talk about it in such a positive way, truly gives me hope. Hi Carrie, Thank you so much for coming to our school today. I’ve heard a lot of speeches and talks at school and your poem was honestly the best of them all! It really inspired all of us, and it was so empowering. Quote | This entry was posted in Uncategorized and tagged authenticity, brave, brene brown, child abuse, courage, eating disorder, girls, help, resilience, sexual abuse, teens, vulnerability, writing. Bookmark the permalink. You write so beautifully and honestly Carrie. In your vulnerability, you give others permission to do the same. When we share in this way, we connect with others and isn’t that what we all want; to love, be loved, be heard and feel connected. And thank you for reading my blog and for affirming for me what I am doing matters. Truly, thank you!